A prominent American neurosurgeon says it is now possible to diagnose in living patients the brain-wasting disease brought to prominence by several high-profile cases in professional sports, calling the ability to identify CTE a "game-changer." Until now, chronic traumatic encephalopathy, or CTE, could only be detected during autopsies, after doctors sliced the brain of a deceased patient into thin strips and examined it under a microscope. Dr. Julian Bailes, one of the lead researchers of a new UCLA study, who claims to have diagnosed CTE in living subjects, told TSN in an interview that the NHL and other pro sports leagues can't "run from the science" and should begin discussions about how to conduct baseline testing of CTE in active players. The alleged medical breakthrough, to be sure, is already being criticized by some neurological experts who caution that UCLA and its spun off company, called Taumark, might make millions of dollars if the CTE test is commercialized. That opportunity may leave them in a conflict of interest when it comes to reporting study results, said Dr. Robert Stern, a professor of neurology and neurosurgery at Boston University School of Medicine and a founder of the Centre for the Study of Traumatic Encephalopathy. Concussions and long-term brain injuries have become hot-button topics throughout pro sports, particularly in pro football and hockey. Researchers have found CTE in the brains of former NHL players Bob Probert, Derek Boogaard, Reggie Fleming and Rick Martin. U.S. government data disclosed last fall revealed that the brains of 76 of 79 former NFL players had evidence of CTE. Dave Duerson and Junior Seau, a pair of NFL All-Pro players who played more than a decade in the NFL, both shot themselves in the chest so their brains could be studied after their deaths. Junior Seau was 43 when he died in 2012. Only this week, Bill Gibbs, a U.S.-based lawyer for the late Steve Montador, the 35-year-old former Chicago Blackhawk who was found dead in his home early Sunday, said he plans to discuss with Montador's family having his brain tested for CTE. That doctors may now be able to diagnose patients including professional athletes and war veterans, and inform them while they are alive that they have CTE, would be an incredible medical advance. Bailes is a clinical professor of neurosurgery at the University of Chicago and is also co-director of the NorthShore Neurological Institute in Evanston, Illinois. He has also advised the NFL players' union and the NCAA about concussions. "It gets old to diagnose a disease after someone's dead - you can't intervene or help them," Bailes said in an interview, adding that he and his research team first detected CTE in the brain of deceased NFL player Mike Webster in 2004. "It wasn't much fun after a while. When you're diagnosing after death, you can't follow the disease with studies over a period of time. You can't develop treatment or drugs over a period of time. So three years ago, we set aside money for research and worked on a technique at UCLA where we used a special PET scan to detect tau protein, which is associated with CTE." A positron emission tomography scan, commonly known as a PET scan, is an imaging test that uses a radioactive substance called a tracer to look for disease in the body. A PET scan shows how organs and tissues are working. The so-called tracer sticks to the tau protein, which is said to indicate Alzheimer's. The amount of radiation used in a PET scan is about the same amount as for most CT scans and the radiation is gone from a patient's body in about five hours. "This is the holy grail of CTE, to make the diagnosis in living people," Bailes said. "It's an intriguing test. But it's not for everyone. People are different. Some people say, 'Why do I want to know I have CTE if there is no cure?' But maybe, if they are an active pro athlete, it may be helpful for a retirement decision. It's a little bit like genetic testing for some diseases. If you're a woman, do you want to know if you have the gene for breast cancer?" Bailes says he is days away from publishing a study of 20 subjects - including former Dallas Cowboys star running back Tony Dorsett, one-time Buffalo Bills player Joe DeLamielleure, and former New York Giants lineman Leonard Marshall - that establishes that CTE can be diagnosed successfully in living patients. Bailes wouldn't say what medical journal will publish his study although the American Journal of Geriatric Psychiatry published his prior study on CTE, which has been linked to Alzheimer's disease. Bailes said the tests cost about $10,000 each, although the price per subject would decrease if many more people sought the testing. The pro athletes who were part of the study were not charged, Bailes said. Many sports leagues and associations have been hit with lawsuits alleging organizers have not done enough to protect players from the long-term effects of head injuries. In Wisconsin this month, the family of a former Pop Warner football league player named Joseph Chernach filed a lawsuit alleging he contracted CTE after playing in a youth league from 1997-2000, beginning when he was 11. That lawsuit came as the judge presiding over thousands of NFL concussion lawsuits told lawyers to adjust a proposed settlement to benefit more retired NFL players. The judge, senior U.S. District Judge Anita B. Brody in Philadelphia, has been helping the NFL and players negotiate a settlement that might pay out $1 billion over 65 years. Also this month, the world's two premier boxing and four mixed martial arts organizations said they would support a study to understand the effects of repeated blows to the head. The ability to detect CTE has been crucial because violent and erratic behaviour has been consistent symptoms of the condition. But there are also uncertain consequences for players who are tested, such as the ability to secure insurance coverage, workers' compensation and other medical benefits or even an NHL contract. Former NHL player Matthew Barnaby told The Buffalo News that some NHL players are afraid to admit publicly that they've suffered a concussion. Barnaby said he played in one game - and fought - when he had lost vision in his left eye. Barnaby said concussions have become an "epidemic." "It's a big business and there's a lot of money involved," Barnaby said. "We all know as players, we know what management thinks of guys who have had one, two, three concussions, whatever the number may be. Every time you have one more diagnosed, you're thought of as damaged goods and your price tag when you become a free agent is going to go down. There might not be anyone come calling." Research linking concussions has already prompted the NHL to make changes, including introducing a quiet room, where players who suffer concussions must remain in dark, quiet conditions until they are clear of symptoms, including dizziness and memory gaps. Even that system has its flaws. During the 2014 playoffs, Montreal Canadien Dale Weise was ruled out of a playoff game against Boston, two days after he was the victim of a vicious and illegal check to the head. He staggered and was clearly dazed, but was allowed to return to the game after a few minutes in the quiet room. 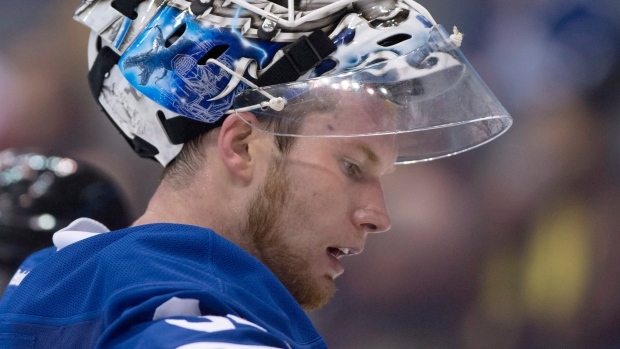 In the Maple Leafs' dressing room, goalie James Reimer said, if given the chance, he'd want to know if he has CTE. "This is like that question, 'Do you want to know right now the day you are going to die?'" Reimer said in an interview. "It's not an easy question to answer. But I think the more knowledge you have about your medical situation, the better. It helps you make more informed decisions. If you have a torn ankle, you want to know how badly torn it is. Same with your brain, if it's damaged, you want to know how bad." Defenceman Stephane Robidas said perhaps half of the players would want to know whether they have CTE. "If you can't do anything about it, knowing if you have that is a tough thing to live with, maybe," Robidas said in an interview. Robidas said he's seen many players through the years affected by severe concussions. "I've been in the penalty box with guys who don't know where they are or what the score of the game is," he said. Robidas said he has had at least two severe concussions during his hockey career. "My last one, I remember Jordan Tootoo hit a teammate and I went in after him and he saw my reflection in the glass and turned around and hit me and I was out," Robidas said. "I woke up in hospital. I had no memory of what happened after he hit me... but this is happening more. The players are bigger, the game is faster, the hooking is out of the game." Robidas said he isn't sure whether he'd want to learn if he has CTE. Former Leafs star Darryl Sittler said the science advancement sounds positive, though he added he isn't concerned because he never suffered a concussion during his career. "From a player's standpoint, if you can have a baseline for this, why not have it?" Sittler said. "The league's trying to improve, with better helmets and face masks and taking head hits out of the game. I think baseline testing would be another tool." NHL deputy commissioner Bill Daly said it was premature to discuss a series of baseline CTE tests. "We and the PA are continuously looking to improve the nature and level of care for our athletes and make that care as state-of-of-the-art as possible," Daly said in an e-mailed statement. "And, historically, we believe we have done a very good job of that. Having said that, there always has to be a high level of satisfaction that the process, method or technology at issue is reliable and has strong consensus support in the medical community before we would be prepared to standardize it on a league-wide basis." To be sure, Bailes's claims have already drawn skepticism from some medical experts. "I am not familiar with his new study," said Dr. Murali Doraiswamy, a professor of psychiatry at Duke University Medical Center and an author of "The Alzheimer's Action Plan." "But there are at least four different tau tracers being developed and several large multi-centre studies are underway. So a small study of 20 subjects would not generate as much enthusiasm today as it might have a few years ago. Also, no tau scan has yet been fully validated, so their diagnostic accuracy for detecting tau is still not established." A neurologist at one prominent U.S. university said the tracer used by Bailes and UCLA to detect tao protein, called FDPPN, is outdated and has "fallen by the wayside." Boston University's Stern is also working on several studies to isolate and identify tau using a different tau marker, known as T-807. Stern said he's testing U.S. military veterans in one study and between 10 and 20 former NFL players in another. "If I were someone who wanted to publish something prematurely, I would have published a case study when we started using it, but the way I do my science is to wait until we have meaningful findings," Stern said. "That is not a few cases. Hopefully, something in the next six months to report on." Bailes said Stern's criticism is off base. "There is nothing wrong with owning rights to a drug nor is there anything wrong in studying it and performing research," he said. "I don't know of a drug company that gives drugs away for free. So as any new drug (and in this case a tracer for the PET scan which labels neurodegeneration-tau protein and amyloid-is treated by FDA like a drug) goes from research to commercialization, the academic institution (in this case UCLA) ordinarily has IP rights and will negotiate with a company to bring this to market-it's basically always done that way." Bailes also rejected the idea that the tracer is out of date. "While the tracer has been around for a few years, it was first used in the neurodegenerative disease Alzheimer's and now this is a new application for another neurodegenerative disease, CTE," he said. "It appears after having done hundreds of scans in patients with neurodegeneration from other causes, that the picture in these persons appear to be a unique pattern for CTE. "It is very common that drugs are around for years and subsequently are found to have other applications or uses. Essentially all new drugs, such as chemotherapy for various cancers, follow this usual route."